Moreover, about 5.5 million South Africans are living with HIV ... This includes 18.8 per cent of adults aged 15 to 49. With 1000 deaths a day, South Africa is home to the largest number of infected people on the whole planet. Among 15- to 24-year-old pregnant women, figures from antenatal clinics show rates around 30 per cent. A whole generation of orphans is being raised by grandparents, their parents dead of AIDS (Cohen, 2008). The two schools I worked in were in the Mitchell's Plains and Guguletu Townships. 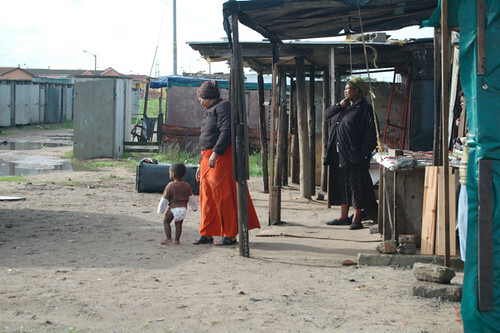 As I learned, "Townships" are the shanty-town neighbourhoods of the black and coloured peoples in the country of South Africa. They are basically poor suburbs with shack-like homes composed of wood and tin (currently being ever-so-slowly upgraded to brick/stucco). 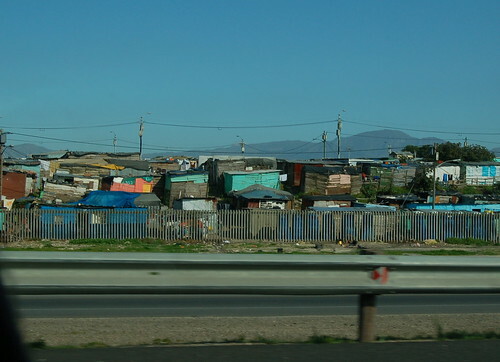 The townships are usually within a long bus or train-ride of the major South African cities, where many of the inhabitants find work in the service and manufacturing sectors. The terms "black and coloured" still linger from the separateness that was legislated by the Apartheid Regime of the National Party in 1950 (lasting until 1994), and Apartheid still leaves its mark on the poor of this country, as there remains a distinction between being "white", "coloured" or "black". But in 2008, times are slowly changing – improvements are being made, mostly due to the unshakable spirit of the people living in these neighbourhoods. Townships are being re-built by local families in conjunction with international NGOs such as Habitat For Humanity. Schools, while challenged by extremely large class-sizes and a host of other issues, are providing better and better education. Clean and safe drinking water and food are more readily available for those who have the money, and there is a burgeoning spirit of entrepreneurship that reminds me of home. Don't get me wrong - the poverty here is palpable, and the crime-rate is alarming – but there is hope and energy. Though some of these educators had had some exposure and workshops on computer use, they have not really made the transition into integrating technology across the curriculum or looked at the big picture of an implementation/use plan. As the workshops progressed, the teachers were excited to try many of the new Web 2.0 technologies and had productive discussions on developing a school wide plan for implementation as well as department and lesson level integration ideas. An important outcome of the workshops was to get participants connected with other educators from South Africa and other countries to collaborate and grow. To that end, those who did not have emails were walked through the process and then we looked at creating an online professional development community with the use of wikis and blogs. 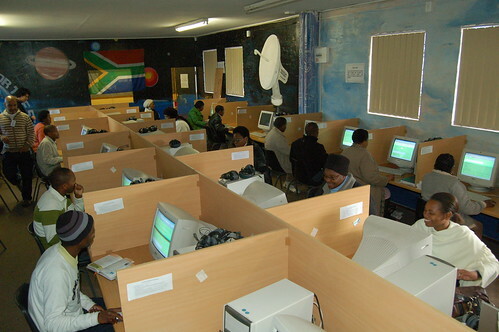 In other words, we focused on basic computer literacy skills (Microsoft Office, browsing, file and email management, editing images). In our other sessions, we focused on more advanced topics, such as blogging, wikis, and even Moodle. We concluded both workshops by focusing on teacher professional development. As the member of the TWB team responsible for the professional development session , I wanted to focus on initiating and sustaining conversations that extend beyond school walls. Throughout the workshops, the South African teachers showed a lot of interest not just in expanding their ICT literacy and integration skills but also in learning about what teaching and learning are like in the developed world. They seemed very interested in getting a glimpse into what our classrooms are like and how we use Web 2.0 tools to engage students. So, the focus of my session was on connecting with other teachers - those working outside of South Africa but also those who work in the same school or the same district. I wanted the teachers to see that the networks they can create locally can be just as meaningful, supportive, and valuable as conversations with people around the world. So, we shared with them some of the tools and platforms that we use to connect with each other . The response to this session was very enthusiastic. In fact, our surveys done at the end of our workshops show clearly that the teachers enjoyed and benefited from every one of our sessions - the ones on file management and the more advanced ones on Moodle and blogging. In short, we have a lot to be proud of. And yet, I know that a lot still needs to be done. During my recent Skype conversation with Swallow Khume , a history teacher and ICT Coordinator at Fezeka High School , I found out that, in his opinion, the enthusiasm for ICT integration has fizzled out. He admitted that teachers have benefited immensely from our workshops and that many still feel empowered by what they have learned. So, we brainstormed how we can continue to encourage and support the teachers in his school and his district. We plan to offer some live professional development sessions (Swallow suggested Skype) - opportunities for teachers to connect, exchange ideas, and develop partnerships. It was good to hear that our workshops have made a difference - Swallow sees the potential at his school for a big shift and I am committed (and I know the other TWB members are too) to helping him support his teachers and build on the foundations that we have laid with our workshops in July. But this will not be an easy task. While at Fezeka, I learned that access to technology is a challenge. The teachers were enthusiastic and very committed to their own professional development, but they all made it clear to us that ICT integration is not easy when the school has only 43 computers for its 1700 students and over 50 teachers. Using Web 2.0 tools is a challenge when Internet use at school is capped at, on average, 7 gigabytes per month. When this limit is reached in two weeks, the school has no Internet access for the rest of the month. So, challenges do exist, but the work we have done in South Africa provided an important foundation and demystified teaching with technology. The school's principal is committed to working out a computer lab schedule to ensure that more teachers and more classes have access to the lab. He is also thinking of raising enough funding to put one computer in most of the classrooms. He also wants to have a computer with an Internet connection in the staffroom. "The key," he said to me at the end of our workshop, "is to ensure that teachers have easy access to the technology. If they do, they will feel more comfortable using it in their teaching." I agree with him and am comforted by the fact that two organizations that were instrumental to our success in Cape Town, Edunova and Khanya , will continue to support the school in the area of ICT integration. I hope that they will also continue to provide Teachers Without Borders - Canada with their insights gained from working with local schools, administrators, and teachers. Overall, the workshops were well received and the participants were very excited to start using their newly acquired skills. They realize what a great resource they have and wanted to start using it to assist in engaging their students and enhancing learning and their own professional development. From our survey, 100% of participants indicated that they increased at least one level of proficiency in their skills and knowledge (a majority jumped at least two levels) and that they would like to see more of these types of workshops and for a longer duration. I think our challenge now lies in ensuring that the support we provide does not end when the TWB team leaves the schools. I plan to be in close contact with the schools, the teachers, Edunova, and Khanya to ensure that there is a kind of networked support coming from a variety of nodes - teachers outside of South Africa, TWB members, and local organizations. This workshop gave us a chance to focus on the technology for one week without any distractions. We've had computer training before, after school, but we had to also teach, so we couldn't devote all our attention to this. This is very helpful. I hope we can have the time to continue to practice and that we have enough computers. a new nation that is promising yet vulnerable, always inspirational but at time outrageous and almost maddening, impressive in the solidarity in its efforts to improve the lot of the people yet driven by the demons of its history. The challenges it will face are many and daunting. Yet on balance, as a work in progress, South Africa remains a beacon to the world. It has proven equal if not superior to comparable countries in its ability to resolve conflicts and manage its economy (Cohen, 2008). I have seen those "demons of its history," and I've seen the promise and the potential. What we have started this past summer is a work in progress. The focus now is to continue to build capacity by maintaining meaningful connections and raising funds and awareness to ensure that TWB-Canada can continue its vision of closing the education divide through teacher professional development and community education . Cohen, R. (2008, Summer/Fall). A work in progress. The new South Africa's first fifteen years. Inroads , 23, 105-116. And then, back in the car, going back to the guesthouse in Cape Town where we’re staying for the duration of our project, I find myself overwhelmed by emotions. Today is my third day in Cape Town working with Teachers Without Borders Canada. Today is when it hits me: In the grand scheme of things, how much can we really do to help? My thoughts take me back to some of the conversations that I’ve had with South African teachers this past week. The teachers who attended our Teachers Without Borders ICT Workshop here in Cape Town have been very enthusiastic about learning how to integrate technology into their lessons. They were the first to admit that the “chalk and talk” approach that is so common in their schools bores students. They told us that they want to differentiate instruction, to engage their students in learning. “I want my students to want to stay in my class,” one of them said to me at lunch. The teachers who participated in our workshop were true lifelong learners. I was very impressed by their passion for learning. They embraced Moodle, they embraced blogging, and their questions and comments made it clear that they see technology integration as a complex, but rewarding task. They want to invest in themselves so that they can improve the learning experiences for their students. When Sharon showed them the four XOs that she was lucky enough to have donated to this project by various institutions and individuals in Canada, the whole room started buzzing . They all wanted to see them. They all wanted to test them. When we took out our Flip cameras , the reaction was equally enthusiastic. Then, at lunch, one of the teachers said to me, “I understand what you mean about engagement. When my students ask me, ‘Miss, what does this word mean?’ I tell them to take out their cell phones and find out for themselves. I want them not to always ask me.” (I was surprised to see how ubiquitous cell phones are here). Of course, they all realize that integrating technology in a meaningful way, in a way that engages and challenges the learners takes time. They know that learning how to use Moodle, for example, is a long process. But what I found truly inspiring about the teachers we worked with is that they were undaunted by these challenges and, in fact, always took the time to consider how the technology could be best integrated into their existing curricula. They did not look at blogging, for example, as a panacea that would automatically engage their students and make them excellent writers. They thought first and foremost about how it could best be used in their classrooms. They thought of their context and how blogging could be used to enforce some of the excellent approaches that they’re already using as teachers of English, or social sciences, or math. When I mentioned how blogging with my students necessitated a shift in my teacherly voice, they all agreed. “This takes a lot of work, but we have to do this for our students,” one of them told me. Yes, it is a challenge. Undergoing that shift is difficult for all teachers. It dethrones us from the privileged, traditional position of the expert. How wonderful to see that teachers here do not cling to that role and want to empower their students. Of course, it’s easy to see why. In our informal interactions at lunch and during breaks, the South African teachers told us repeatedly that their country is a “young democracy” and that it “needs time to grow.” One of the comments that I heard over and over again from the teachers was that “education is key.” This morning, when we first drove into the township of Langa, the oldest area of black resettlement in Cape Town (created in 1927), our tour guide echoed the statement I’d heard so many times from the teachers, “Education is key.” He meant that it’s key to individual success and opportunities, and key as a solution to the crippling poverty that surrounded us as soon as we entered the township. Such a simple, yet powerful realization. “Education is key.” This is why I’m here. 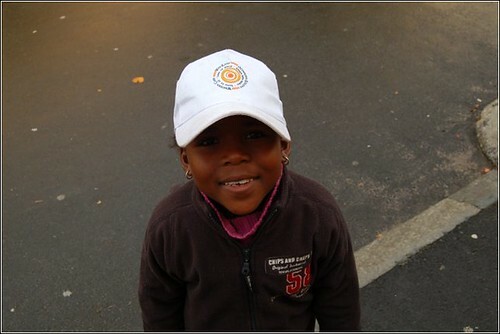 This is why I signed up to be part of this Teachers Without Borders project in South Africa. It’s also an answer to the question that’s been troubling me ever since my brief encounter this morning with that five-year-old girl: In the grand scheme of things, how much can we really do to help? As many of the people I have met since I arrived here last week have emphasized, the answer is quite clear: Education is key. So, we will continue to have conversations with the teachers here. We will continue to assist them as they develop technology integration approaches that are grounded in the existing South African contexts. We will continue to remind each other that, as Paulo Freire argued in many of his writings, teachers are political beings who can effect change only if they see themselves as political agents and not mere handout technicians. If you're interested in learning more about our TWB projects this summer, please read Sharon Peters' entry .